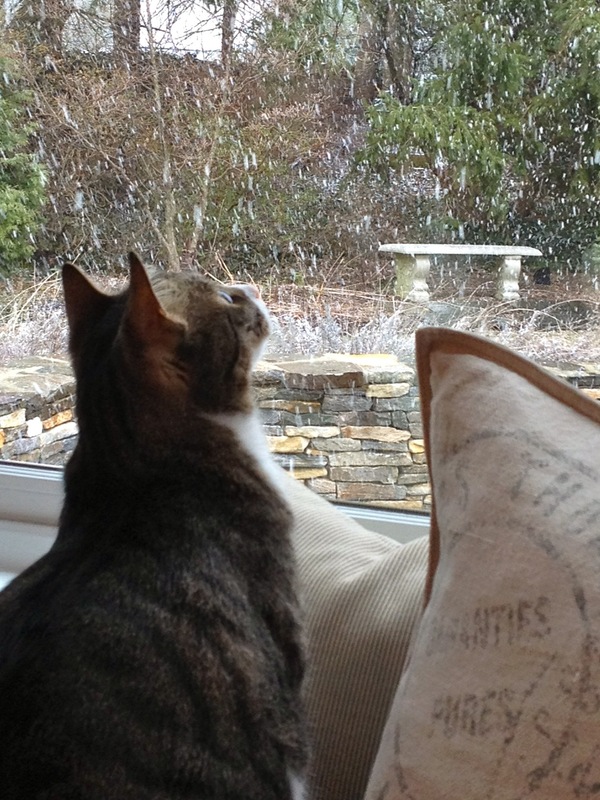 While many of our friends are lounging around in sunny locales this week for spring break, sipping Piña Coladas (or Shirley Temples) and worrying about nothing but SPF coverage, we are hunkering down at home – gearing up for another snowstorm (?!) and making To Do lists for our New Jersey “staycation”. 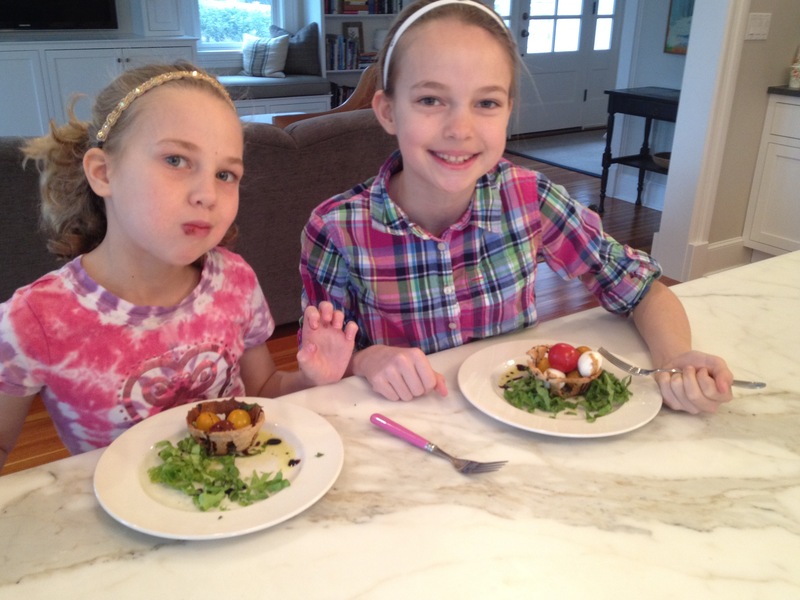 Today’s activity: a craft that doubles as dinner (or lunch, as was the case today). 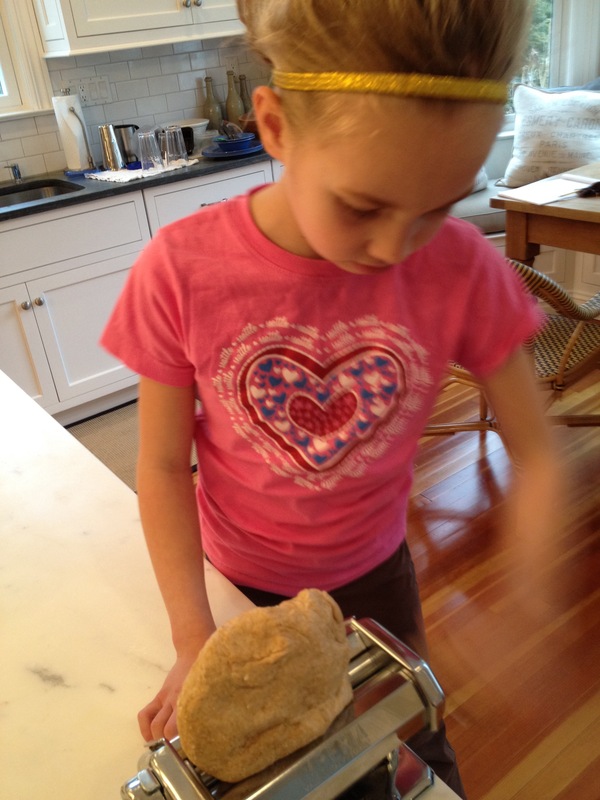 Homemade cracker dough is easy to make and almost as fun as Play-doh – you can roll it, extrude it (in a pasta machine), cut it into shapes, and “decorate” it with herbs and seeds. However, I’m most excited about my new (never before seen!) Easter-inspired application: woven cracker baskets. That’s right, Pinterest fans – I’m claiming it here first. If only I could copyright the idea we might find ourselves in a sunny locale for next year’s spring break. 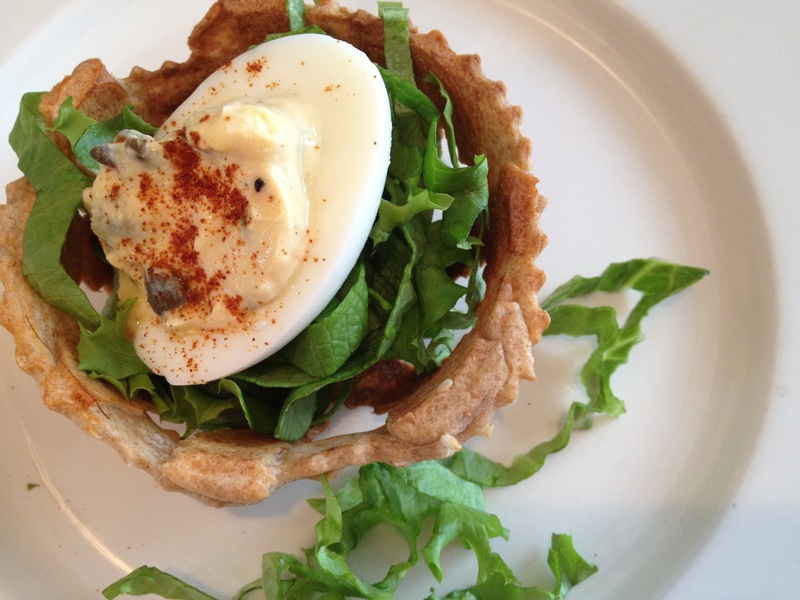 The Cracker Basket – a Subee’s Kitchen Original! 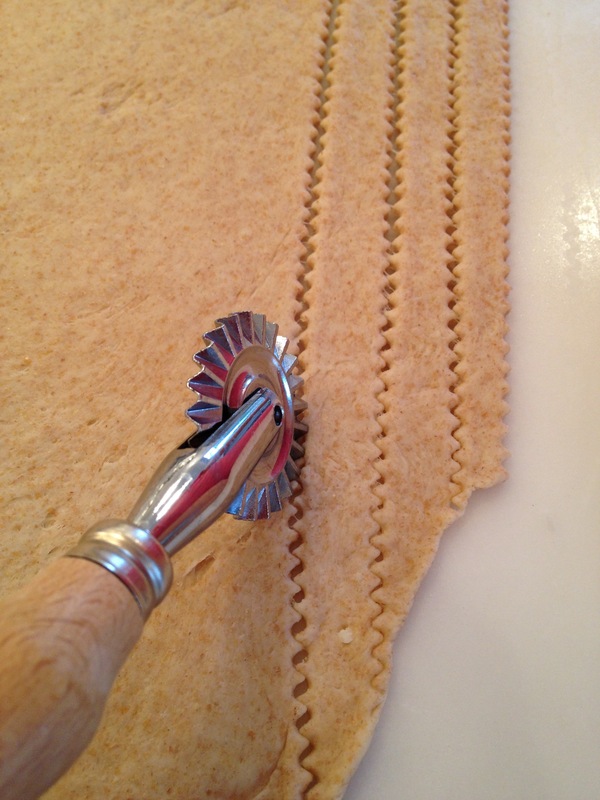 Rolling out cracker dough with a pasta machine. Or – with a little elbow grease. 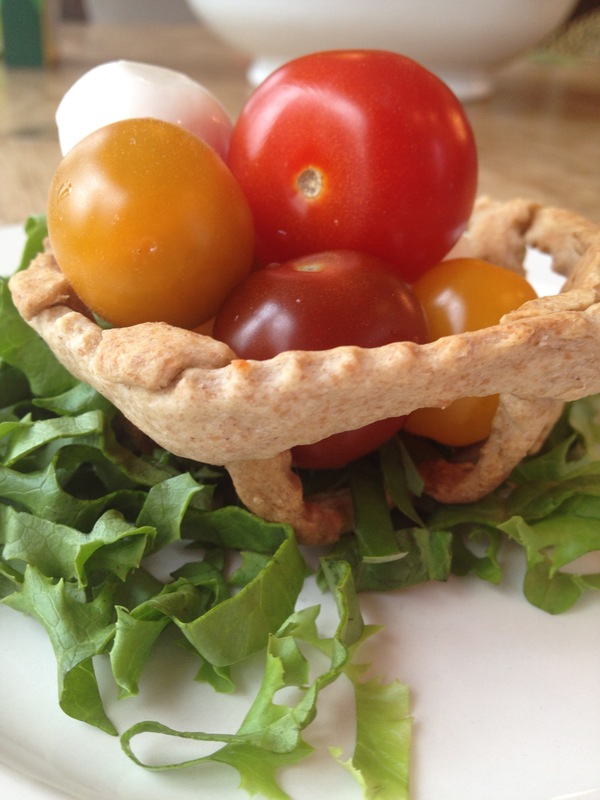 Cracker baskets ready for salad assembly. These cute little cracker baskets can be made several days ahead and kept in an airtight container. They’re fragile, though, so make extras in case some break. (The broken bits are still tasty.) And if basket-making sounds a little too adventurous, you should still try your hand at making homemade crackers – wholesome, economical, and very chic with a cheese tray or as a hostess gift. 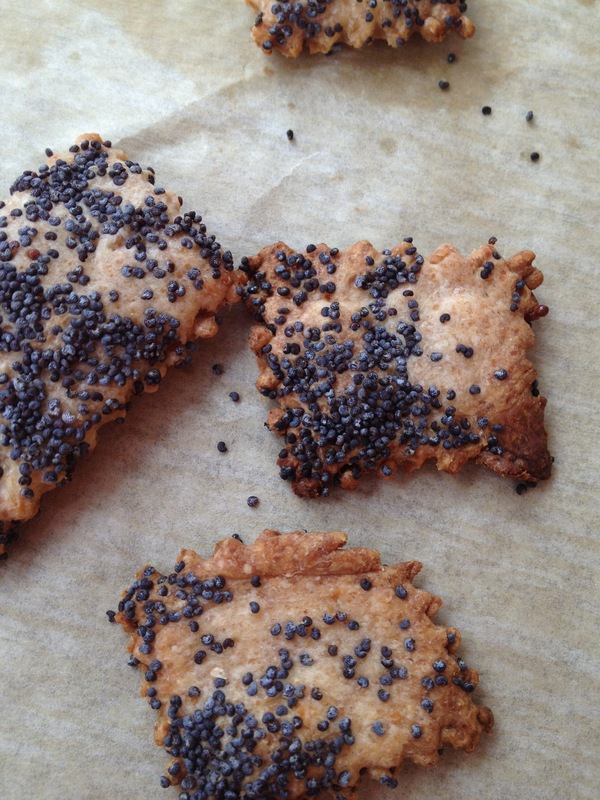 Homemade poppy seed “wheat thins”. The basic cracker dough can be modified to taste: use whole wheat flour, all-purpose flour, or a combination like we did; add up to a cup of parmesan cheese for an additional flavor boost; use honey instead of sugar; and of course, you can customize your crackers with your favorite seeds, herbs or spices. 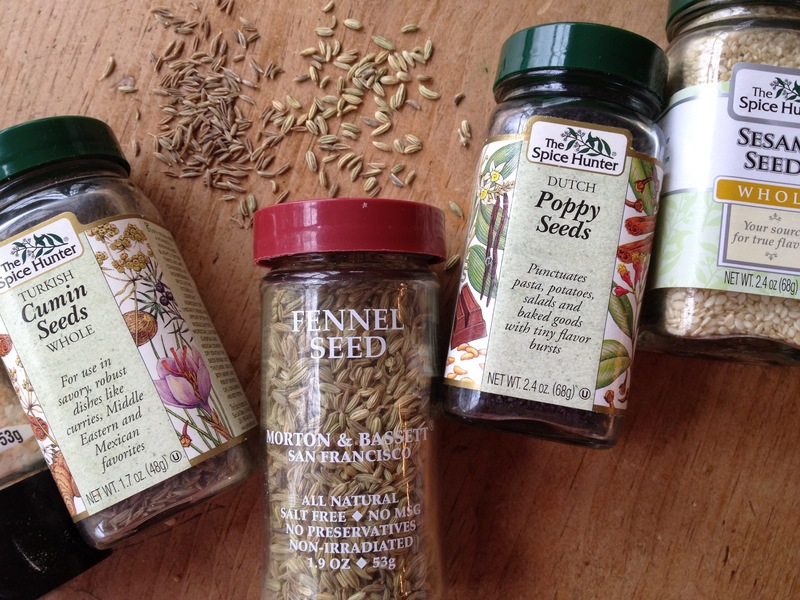 Optional toppings: sesame seeds, poppy seeds, chopped fresh rosemary, kosher or sea salt (use sparingly), cumin seeds, fennel seeds, etc. Set oven rack in bottom third of the oven; preheat to 450F. 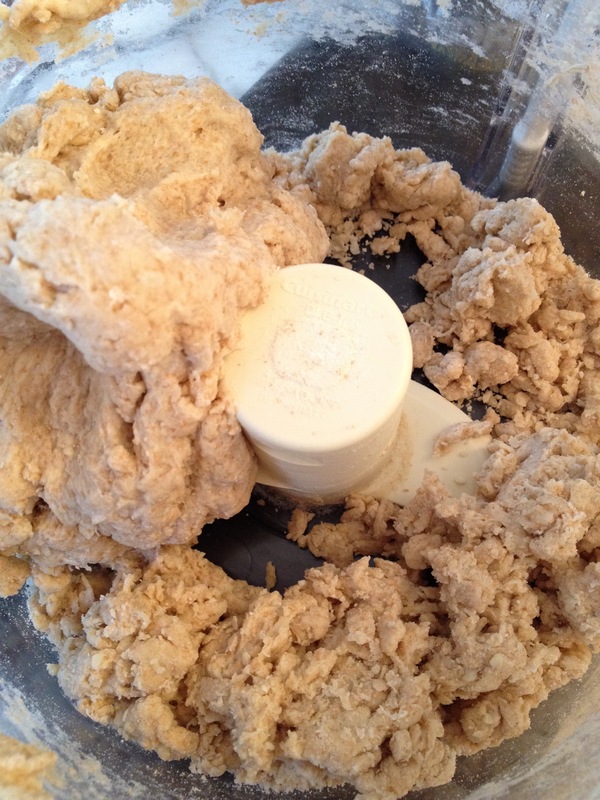 Roll out each dough block into a large rectangle approximately 1/8” thick. 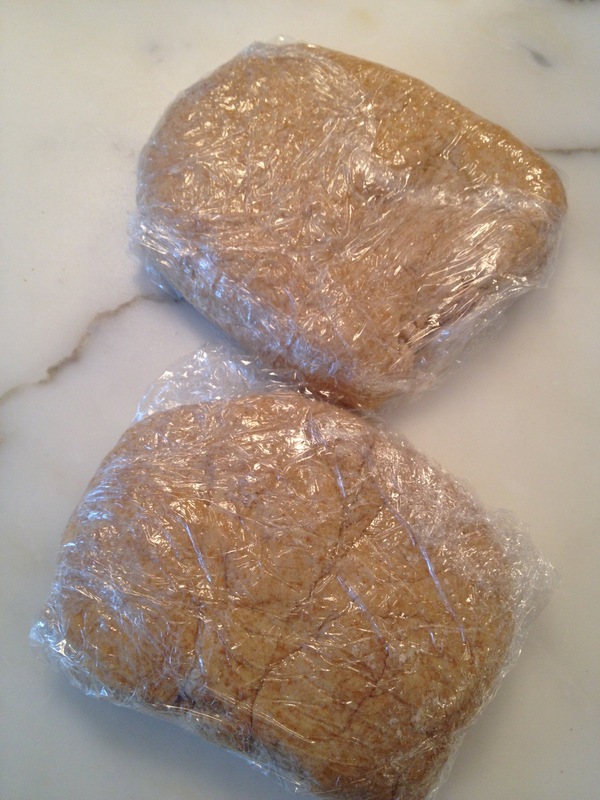 (Or, if you have a pasta machine, you can roll out the dough using that as well; this works better if you’ve let the dough rest in the refrigerator for a few hours or overnight.) 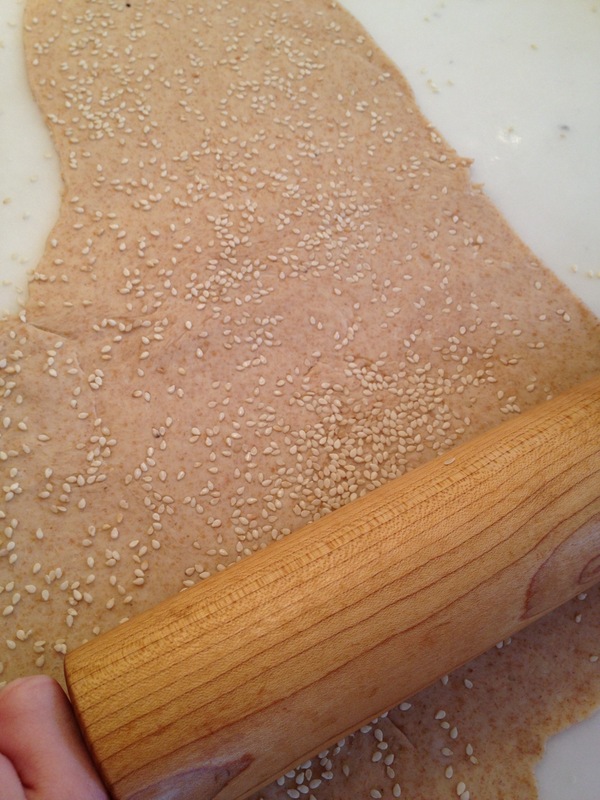 Sprinkle with seeds or toppings (if using) and roll again a few times to press into the dough. 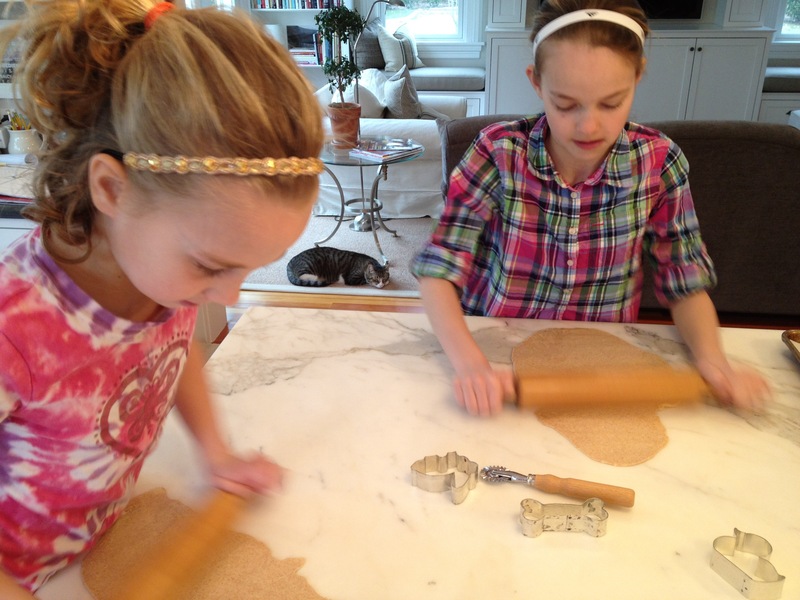 Transfer the rolled out dough rectangle to a baking sheet and then cut into shapes or simple rectangles. 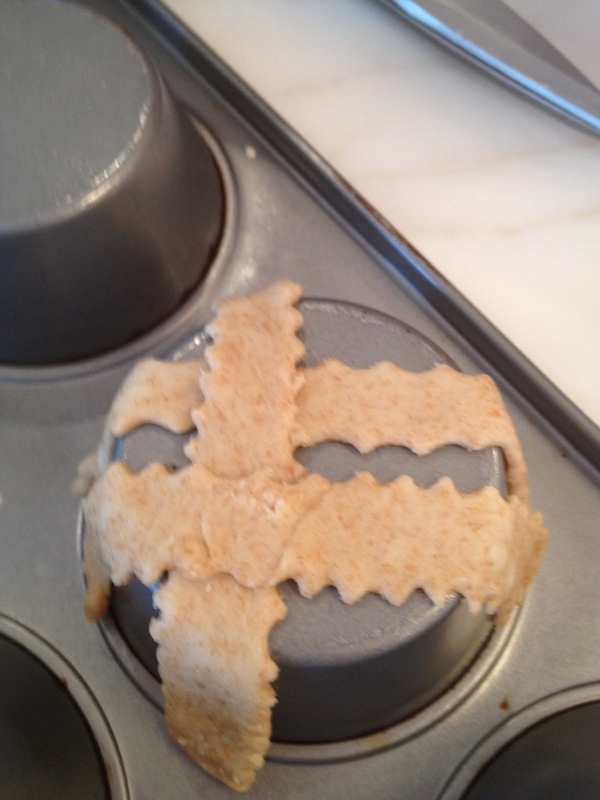 (This minimizes shape distortion, though don’t worry about perfect edges; you want the crackers to look homemade!) 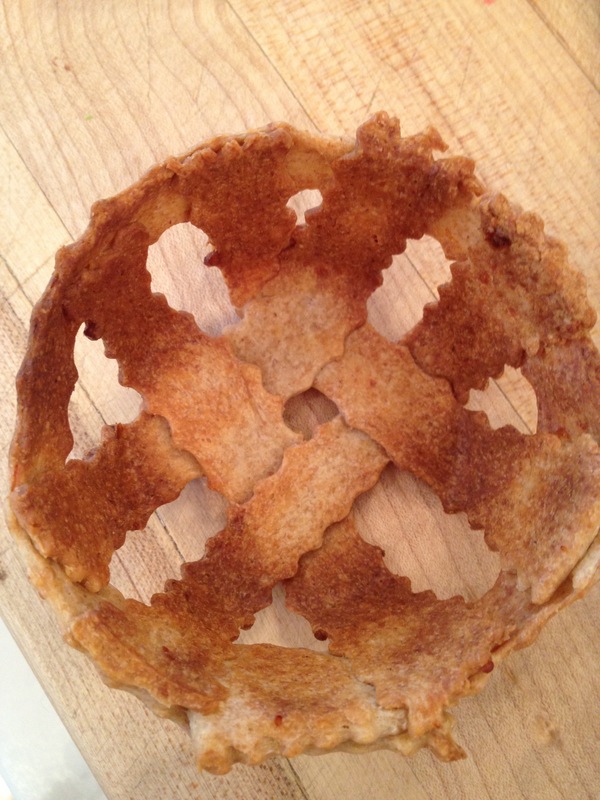 The dough doesn’t puff up, so crackers can be baked close together. Bake for 8-10 minutes, or until golden brown. 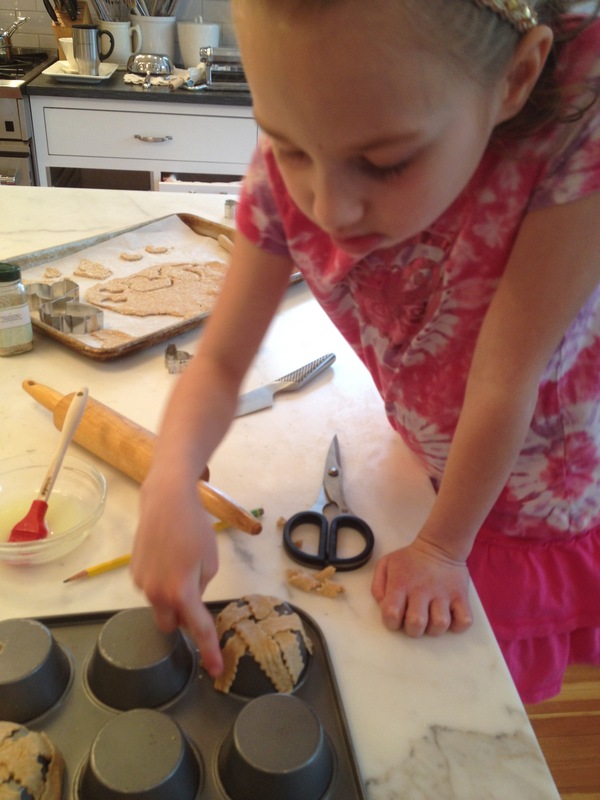 Using a knife, pizza wheel or pasta wheel, cut dough into strips approximately ½” wide. For each basket, you’ll need 4 strips that are 5” long and one that’s 10” long. 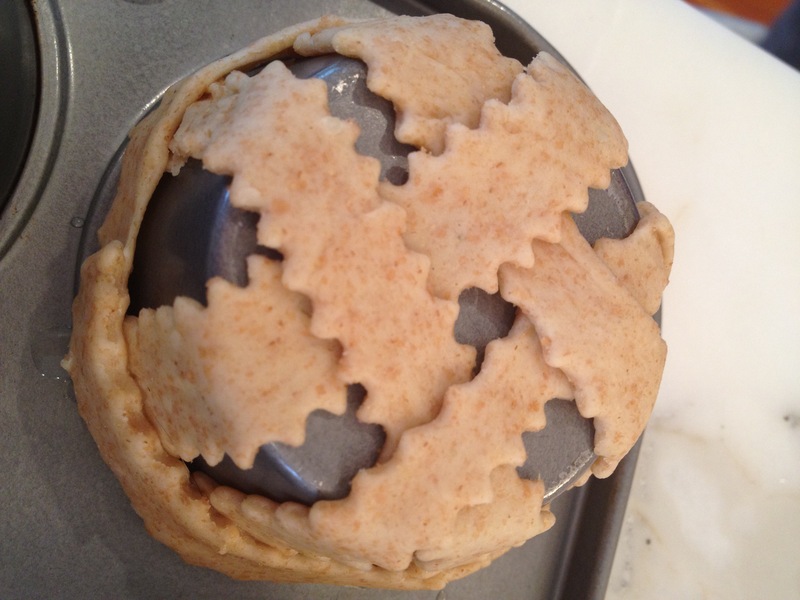 Turn a muffin tin upside down and place two 5” strips across the bottom of a muffin form. Then, weave two more 5” strips going perpendicular in a lattice pattern (alternating one strip under, one strip over). Still with us?? 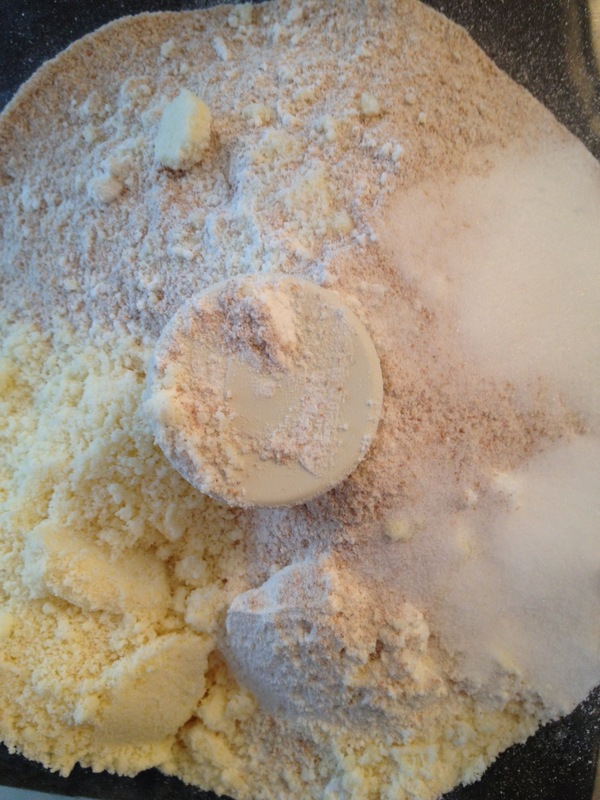 Using clean scissors or kitchen shears, trim any excess dough around the base of the muffin form. (This will be the top of the basket.) Using your finger, dab a little egg white on the end of each dough strip. Finally, wrap the 10” long strip around the base of the muffin form and press it against the egg-dabbed strips. They should now look like upside-down baskets. Repeat for the desired number of baskets, alternating every other muffin form to ensure the baskets don’t stick to each other during baking. 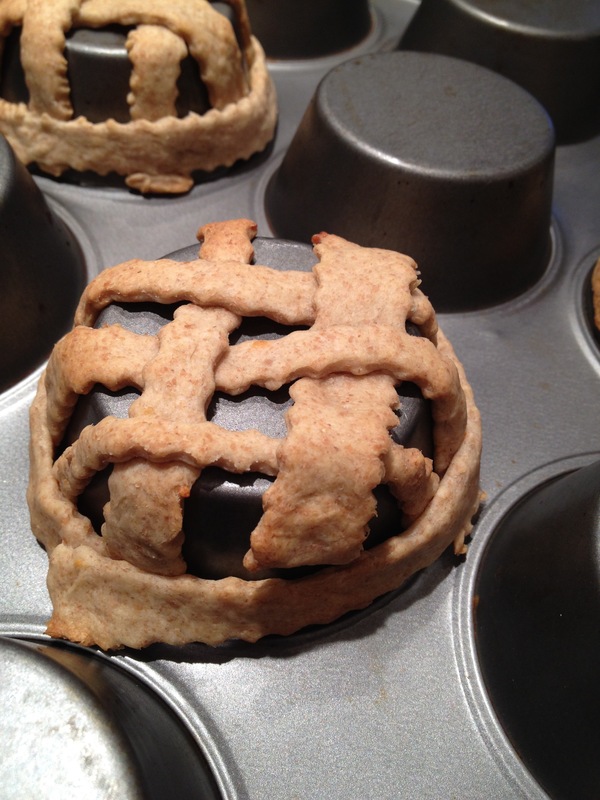 Allow baskets to cool on the muffin tins. Serve right away or store cooled baskets in zip-lock bags or air-tight containers until ready to serve. Sprinkle each serving plate with ½ cup shredded lettuce. 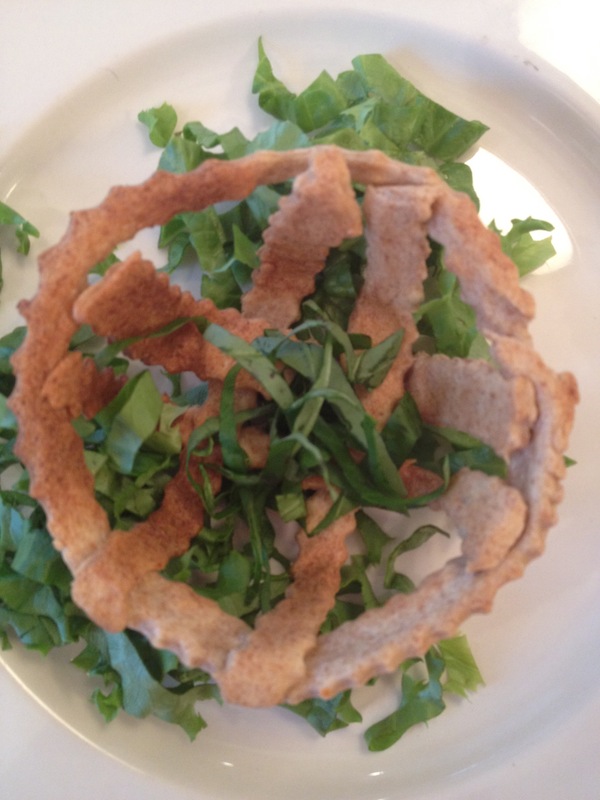 Place cracker basket on top and add 1 tablespoon shredded basil to each basket. 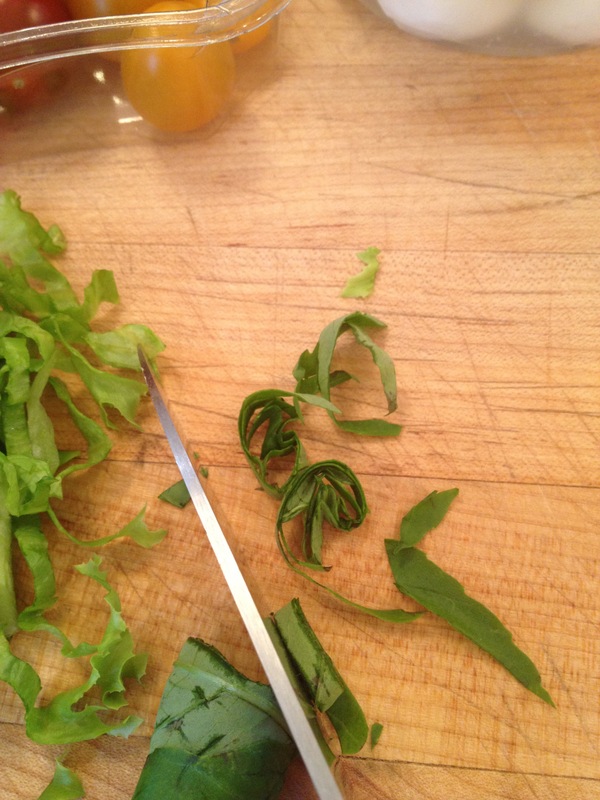 Roll up stacks of basil leaves and slice thinly to make a chiffonade. 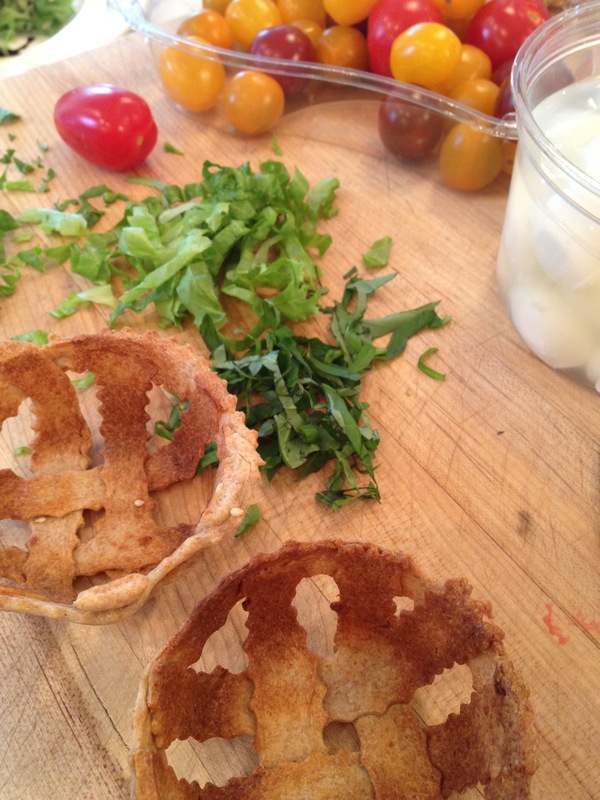 Add cherry tomatoes and mozzarella balls. 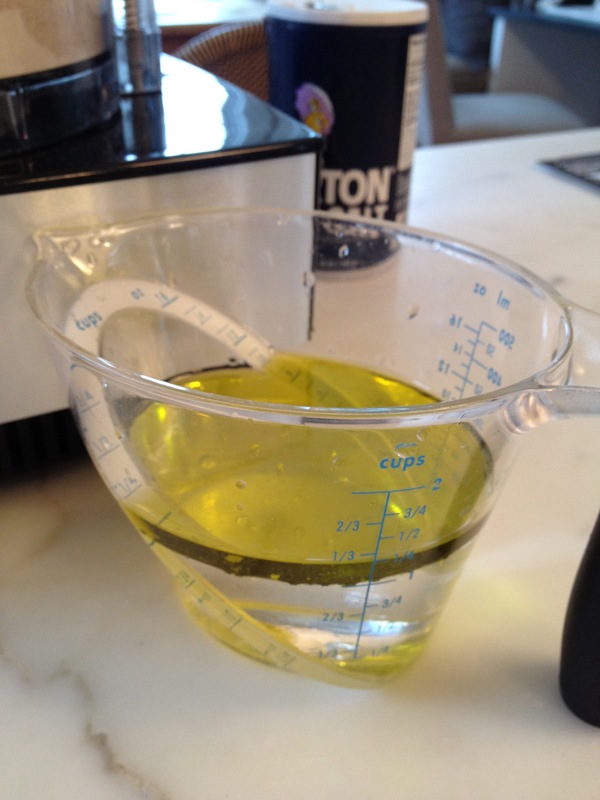 Drizzle with extra-virgin olive oil and balsamic vinegar. Sprinkle with kosher salt and freshly ground black pepper. Serve right away. 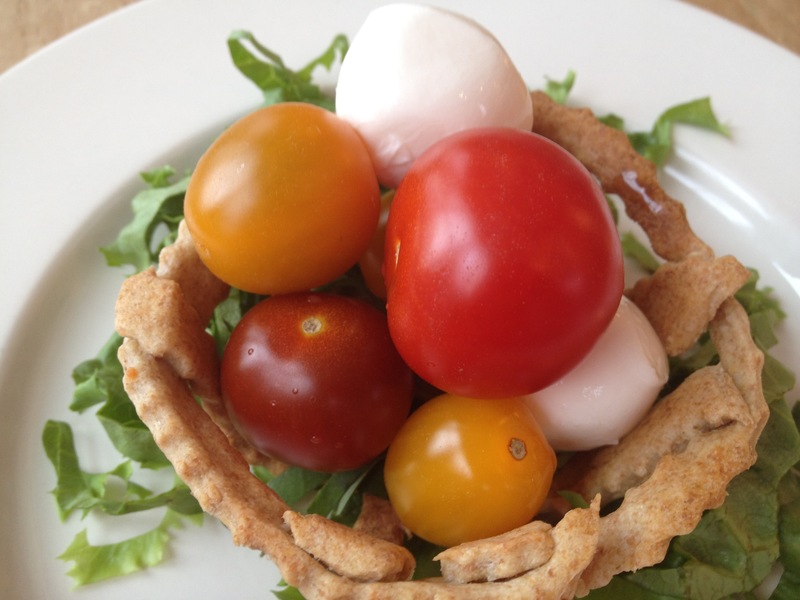 Make your cracker baskets and eat them, too! 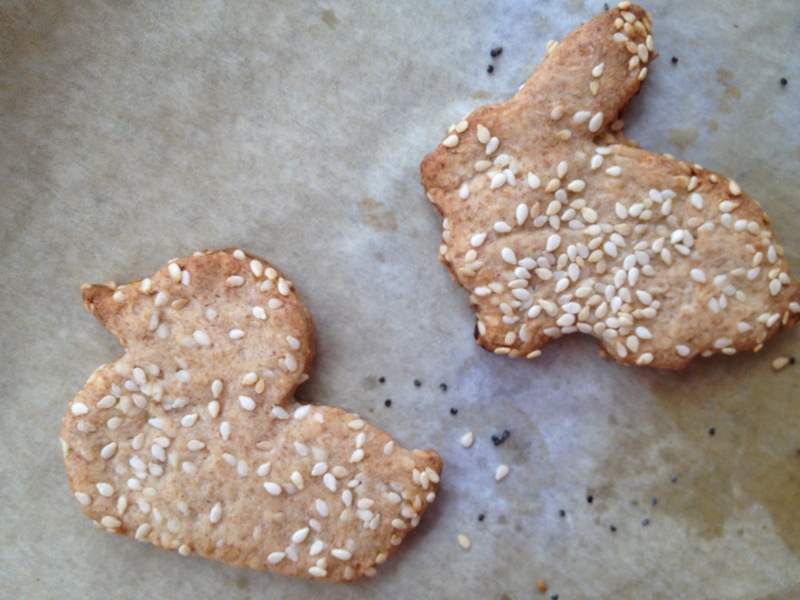 Another Easter-esque cracker basket option? 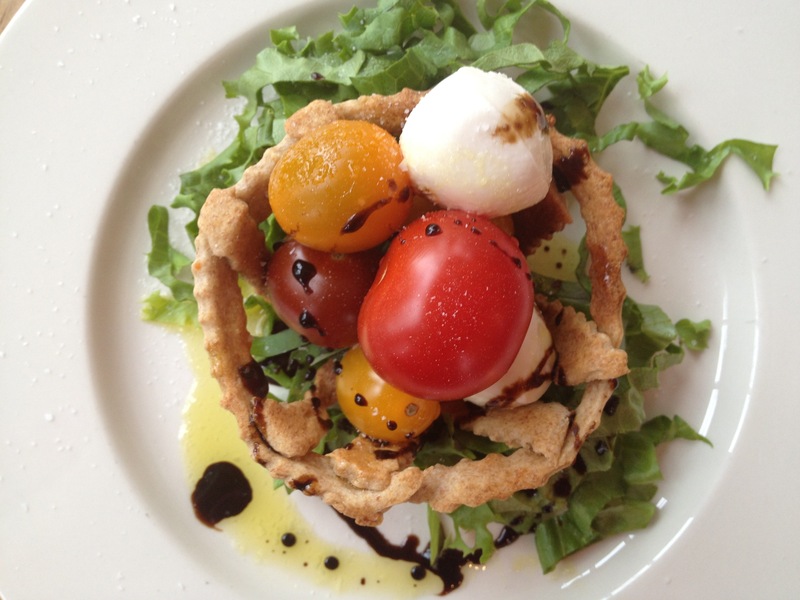 Top with a deviled egg or two instead of the tomatoes and mozzarella. 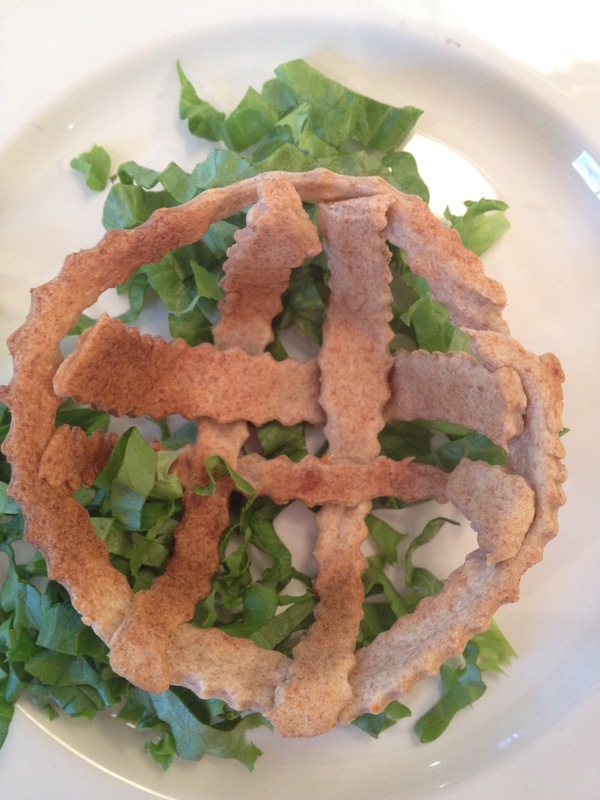 This entry was posted in Appetizers, Breads, Crafts, Entertaining, Holidays, Kids & Family, Salads and tagged baking, Easter, homemade crackers, kids' crafts, kids' food, tomato salad by subeeskitchen. Bookmark the permalink.